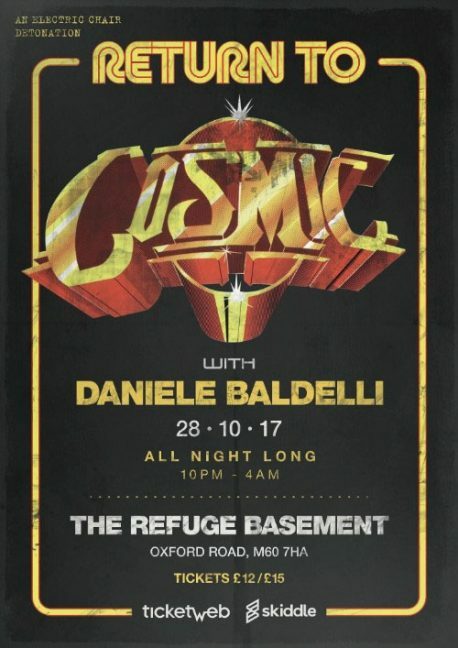 The Refuge and Electric Chair are hosting a six-hour cosmic disco marathon with veteran producer Daniele Baldelli at the end of October. For one night only, Baldelli will recreate his legendary nights on the banks of Lake Garda, at which he pioneered the cosmic disco sound in the 1970s. Expect plenty of electronic sounds and surprises from the man who was beatmatching and creating his own edits years ahead of his contemporaries. There’s a pre-show warm up in the bar from 3pm with tunes from James Holroyd and Bonar ‘PBR Streetgang’ Bradberry. We have a couple of packages of four tickets to give away to lucky Wire readers. Simply email competitions [at] manchesterwire [dot] co [dot] uk with your name, age and Twitter handle and we’ll get back to you. Over 18s only.